I find it ironic liberals complaining that popular majority doesn't pick the President. Liberals push their agenda through the court systems with law suits and bench rulings. The majority of the USA doesn't want or agree with most of the social justice issues liberal judges push. How many times did Ultra liberal California vote against gay marriage? No worries, your explanation was solid. 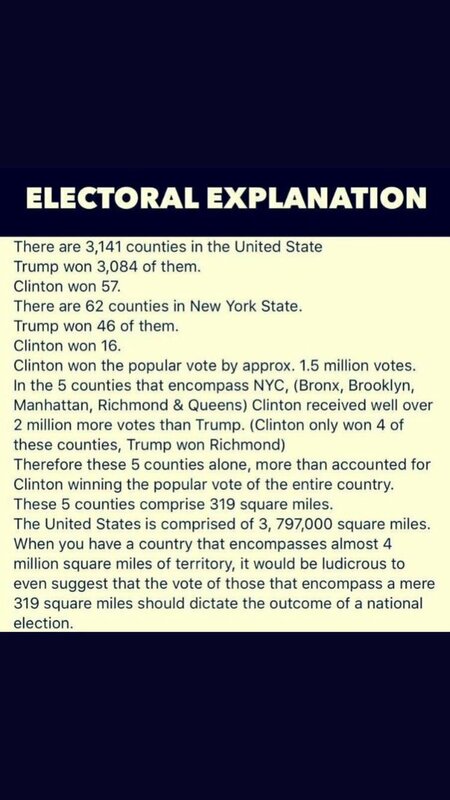 The Electoral college is based on equal representation of all the states. If the popular vote were used only a handful of states on the coasts with the highest populations would control the rest of the country. Also, without the electoral college Abraham Lincoln wouldn't have become president & the end of slavery may not have happened the way it did. Those who are against the electoral college are against the United States. Most of the same people who are against the electoral college are also against due-process, against the 2nd amendment and are against our constitution in general. You're welcome! I would like to see more electors bound but I would only give the states the power to bound their own electors. As it stands now 29 states and the district of Columbia are bound. For the most part electors "do as their told" but I agree. Luckily there are 538 Electors, so a few acting out against their states, wouldn't(shouldn't) affect an election greatly, and IF IT DID, I'm sure we'd have a revolution in our hands, or at the very least a revote, with those specific electors being fined and/or Imprisoned. In the past some electors have acted against what they were told and it never affected the election and they were fined by their states. Usually the "acting out" is a simple refusal to vote. This explained it for me. In essence, electoral votes are weighed by acreage/consensus population data, so that in effect the aggregate power of voting is leveraged by total landowners factored across the relevant states total population rather than solely on just actual numbers of people. Not that the argument for it is really any better. You can kind of pick your poison: Is it better for many people to rule the few, or few people to rule the many?